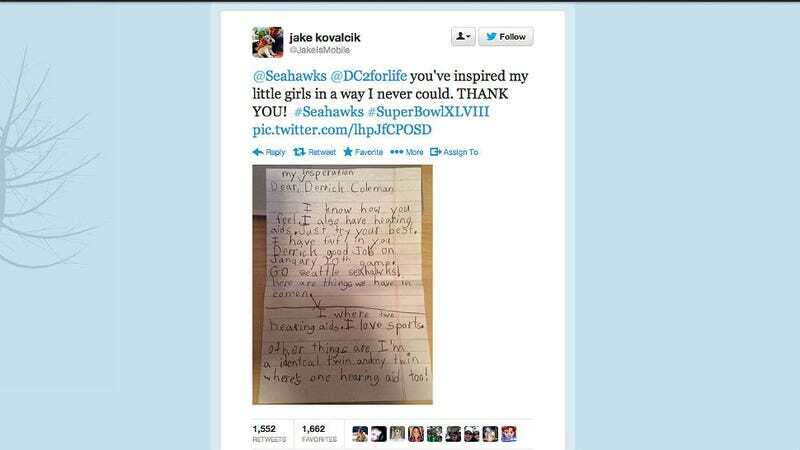 Today in adorable, two little girls are now lifelong fans of the Seattle Seahawks and deaf player Derrick Coleman. Recently, the baller released a sniffle-worthy commercial chronicling his rise to the NFL despite being legally deaf since he was three years old. I definitely teared up when I watched the ad, then cursed myself for getting misty over batteries. But I wasn't the only one. I know how you feel. I also have hearing aids. Just try your best. I have faith in you Derrick. Good job on the January 20th game. Go Seattle Seahawks! I wear two hearing aids. Other things are I'm an identical twin and my twin wears one hearing aid too! Ah! The cute is tugging at my heartstrings again. Coleman wrote the girls back via Twitter today. I don't think I can take anymore cute for today, seriously.